At most Japanese festivals, you can usually find carnival booths where you can try to catch goldfish with a paper scoop. As you might imagine, the paper doesn’t last too long, so there’s a certain amount of speed, skill, and luck involved. 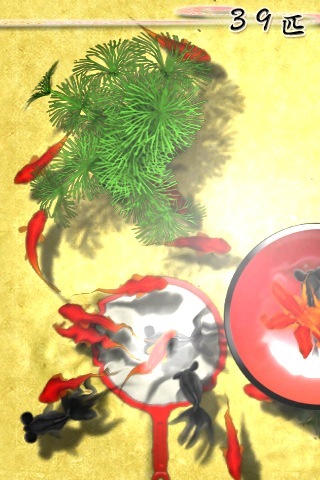 Sakura Goldfishing tries to bring this traditional game to your iPhone. There are no actual fish involved, so unlike the real game, you don’t get stuck feeding the fish once you’re done with the game. The game is much, much prettier than the average carnival booth set-up. You have a serenely clean looking pond, teeming with fish. In regular mode, you have three scoops and a water-filled rice bowl to keep your caught fish in. The game relies on the accelerometer to scoop up the fish, although there are no instructions to be found, so it actually took me awhile to figure out how to play. You move the scoop and the bowl around with the touch screen, and once you have everything set up the way you want, you quickly scoop. Fish are spooked by movement, so this usually requires a bit of patience and luck. If you’ve managed to get a fish, you then want to dump it in the bowl to get your points. Plain goldfish are worth 1 point and black goldfish are worth 2. Scoops eventually disintegrate, so you have to work fast, although these scoops are much more durable than the real thing, so you can usually get many tries with a single scoop. I found the game to be much slower than the real thing. There is a high score board to urge you on, but it takes so long to get through all three scoops that I rarely ever even finished a game. I would just fish until I got bored, which generally happened pretty quickly. There’s not much of a challenge in catching the fish, although the setting is pretty. You even have the option of changing the backgrounds, although they’re all fairly simple and similar. Sakura Goldfishing is less of a game and more of a relaxation tool. In addition to the regular game, there is also a Zen mode which is effectively a fish pond that you can poke to scare the fish if you like. It’s not super engaging, but combined with the gentle music and serene settings, it can be fairly relaxing. Although the game is very basic, it is still in need of some brief instructions, and more types of fish would probably help keep the game a little more dynamic and interesting. I would love to see a version with more fish to catch, and a Zen mode populated with caught fish. Sakura Goldfishing looks great, but it sorely needs more action if it is to be an interesting game. AppSafari review of Sakura Goldfishing was written by Tracy Yonemoto on May 11th, 2010 and categorized under Action, App Store, Games. Page viewed 3806 times, 1 so far today. Need help on using these apps? Please read the Help Page.